Back in action after the bye week, the Seahawks hope to get tight end Ed Dickson and linebacker K.J. Wright back this week. They also made a 53-man roster move. The Seahawks got back to work Monday following their trip to London and their bye week. They were on the field for a little more than an hour at the VMAC in Renton as they begin preparations for the game Sunday at Detroit. They did so with a roster fortified by a few players returning from injury, and buoyed by a few words from coach Pete Carroll on the passing of owner Paul Allen a week ago. Carroll spoke almost exactly a week to the moment when Allen’s death was announced. While there have been rumors the Seahawks could eventually be sold, nothing has been officially announced, and it could be a while before Allen’s estate deals with the two pro sports teams he owned — the Seahawks and the Portland Trail Blazers. Monday marked the first chance Carroll has had to address the whole team since Allen’s death. “Everything is going to be like we have been doing it and we will carry on with the same intensity and expectations and support and all of that, and that it (is) our job to really carry on in the fashion that Paul wanted us to and designed this to happen and so we have that responsibility and everybody is excited about doing that for him,’’ Carroll said. K.J. Wright has been out all season after having arthroscopic knee surgery, but he returned to the field Monday and might be able to play Sunday. Ed Dickson has been on the Non-Football Injury list with a quad injury suffered in offseason training. Monday was the first day he was eligible to practice and he can play immediately. But the team would have to make a move to restore him to the 53-man active roster (unlike with Wright, who has been on the active roster all along). 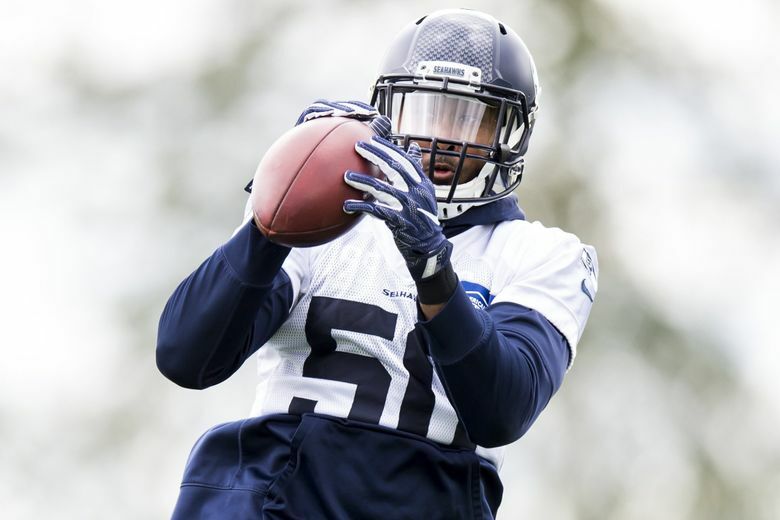 Asked whether Wright could potentially play against Detroit, Carroll the Seahawks would “look after him for sure’’ and see how he progresses through the week. The Seahawks have largely gone with a nickel defense the past two weeks, using Barkevious Mingo in weakside linebacker roles along with Bobby Wagner in the middle. The Seahawks could continue to use that scheme to ease Wright back in. It’s been a new role for Mingo and Carroll said it gives the team some flexibility it wasn’t really expecting. The Seahawks began the season thinking Mingo would play mostly strongside linebacker in the base defense and be a rusher in the nickel. Meanwhile, Dickson would add a fourth tight end to the 53-man roster if he returns this week along with Nick Vannett, Darrell Daniels and Tyrone Swoopes. Vannett sat out against the Raiders with a back issue but he practiced Monday and also wrote on Twitter on Sunday that he feels good to go. So Seattle might have a decision to make about how many tight ends to keep. With Vannett out for the London game, the Seahawks added Swoopes to the active roster the day before they played the Raiders to assure a second tight end on game day. Seattle signed Mychal Kendricks in the wake of Wright’s injury and he started three games at weakside linebacker before being indefinitely suspended for his guilty plea to insider trading. Seattle has received no clear word on how long Kendricks will be out since the suspension was announced. But Carroll hinted that could happen this week when he said Kendricks had a “significant’’ hearing with the league Monday. Carroll said he wouldn’t call the hearing an appeal, just one that had apparently been on the docket for a while. Players get paid if they are on the active roster by Tuesday, so the Seahawks would undoubtedly find out by Wednesday if Kendricks was going to be eligible to play again this week. Obviously, Seattle would also then have a decision to make about how to fit him on the roster — he does not count against the active roster limit while suspended. The Seahawks made one change to the 53-man roster Monday, one that was forced on them when safety T.J. Green decided to give up football. Green, who was signed after the season-ending injury to Earl Thomas, was not active for the two games he was on Seattle’s roster. Carroll said all he knew is that Green “was done playing football.’’ Seattle retains his rights, with Green officially listed as exempt. So if he decided to play again he’d again become a member of the Seahawks. To take his place on the 53-man roster Seattle, claimed linebacker Emmanuel Ellerbee off waivers from the Chargers. An undrafted rookie free agent from Rice, Ellerbee was in camp with the Falcons before being waived. He then joined the Chargers, for whom he played in three games without recording a statistic. That Ellerbee played for two teams whose defenses are run by former Seahawks coordinators is a plus, Carroll said. “That always helps knowing that there will be a little bit of ease in the transition,’’ Carroll said. The 6-foot-1, 236-pounder played middle linebacker and weakside backer for the Chargers and also on special teams. Seahawks coach Pete Carroll gives injury updates as the team returned from its bye week Monday.